You may think that one type of beef is just as good as another. Today we’re going to share just five reasons why Hereford Beef should be your beef of choice, whether you’re serving a dish for your family or your paying customers. Hereford Beef contains plenty of marbled fat throughout the different cuts of meat. This marbling results in a delicious cook every time. The meat is full of flavour and extremely succulent, meaning it tastes fantastic. We all care about where our food comes from and know that it is important to eat the finest foods to gain the best nutritional benefits. Hereford beef is bred and farmed to the highest animal welfare standards, enjoying a life being fed lush grass from rich pastures in glorious countryside. As they are grass fed the meat has a delicious flavour not found in breeds that are fed on grains, fed additives and growth hormones. Hereford Beef is rich in protein, iron and Vitamin B. Our bodies need protein because almost all of the functions in our cells and organs are controlled by proteins. We absorb all the proteins from the food we eat, they are broken down and sent to the different parts of the body where they are needed. Once there our bodies either create new proteins or used it to release energy. Iron is needed so we’re able to create red blood cells that carry oxygen around the body. Vitamin B has many benefits including keeping muscles and nerves healthy and helping the body to break down foods and release the energy inside. To ensure the finest flavours Hereford Beef is hung until it reaches maturity and a deep red colour. As a result the meat is extra tender and has a delicious taste. The Hereford breed is naturally free from stress and their quality of life grazing on farmland only works to compliment this side of their personalities. 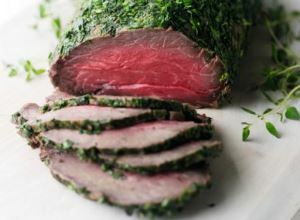 The meat is succulent and tender, benefiting from their quality of life and stress free nature too. Come and tell us why you choose Hereford Beef on Facebook or Twitter.